BALTIMORE (CNS) — As Catholic Relief Services staffers and supporters spent an evening marking 75 years of service in the world, one word recurred: dignity. Bishop Gerald F. Kicanas, who chaired the CRS board of directors from 2010 to 2013, spoke of it in his homily at a special Mass Dec. 5 in St. Stephen’s Chapel at the organization’s Baltimore headquarters. 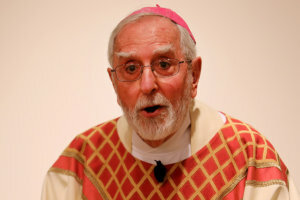 Bishop Kicanas, who often visited CRS projects when he was chairman of the board, spoke of all the places he saw this occur: in Lebanon’s Bekaa Valley, where children scrounge for food; in India’s Uttar Pradesh state, where CRS helps women fight infant mortality. “CRS for 75 years has been hovering over the vulnerable,” he said, calling the international relief and development agency determined, resolved and patient. “CRS will not fail,” he said, urging staffers to continue their work for another 25 years. 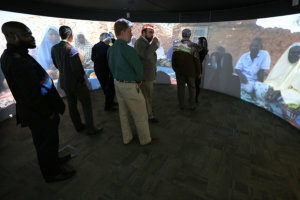 Caroline Brennan, emergency communications director for the CRS Humanitarian Response Department, spoke animatedly as she took people on a tour of how the agency responds in an emergency. She spoke of the need to jumpstart the local economy — if anything remains after a disaster — and explained how the voucher system or debit cards allowed people to buy from the local vendors of their choice. Each situation is different, she explained, so CRS officials must decide “what’s happening locally here.” Emergency housing often includes tarps over a temporary structure of local materials — bamboo, wood or concrete clocks. Not only does it protect people from the elements, she said, but it allows them some privacy and the chance to grieve if they have lost loved ones in the disaster. CRS wants to give “a semblance of dignity to families,” she said. Bassam Nasser, head of the CRS office in Gaza, told Catholic News Service his office favors electronic voucher programs for families so they can purchase “what they need, not what we decide for them.” Some families told CRS staffers they were appreciative that, when they went to the grocery store, they did not look like they were purchasing food differently than other families. “We stand for the dignity of the people,” Nasser said. 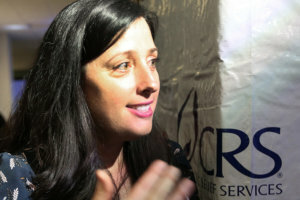 Toward the end of the celebration, some CRS staffers — and beneficiaries — were featured in a living history of the agency. Sean Callahan, president and CEO of Catholic Relief Services, and Cecilia Suarez, country manager for CRS in Mexico, introduced people who had contributed to the agency over the decades. They came from Syria, Ghana, Tanzania, Rwanda, the Soviet Union and El Salvador. Several were helped by CRS and later worked for the agency. Rosa Anaya, a victim of El Salvador’s war, has worked with young people for 20 years and currently leads a CRS youth rehabilitation program in Salvadoran prisons. “We often hear today about people fleeing violence and conflict, but we don’t hear as often about the efforts of people like Rosa, who are working every day to reduce violence in their home country, giving people a chance … a second chance … however many chances it takes … to live in peace with their family and loved ones,” Callahan said. For the family from Syria, resettled in countries around the world after fleeing the civil war, “Home is Skype, where they can eat together as a family,” Callahan said.